My Bubba & Elsa Sjunger Visor // Sing Swedish Songs is a collection of our favorite folk songs. They were recorded deep in the Swedish woods together with our longtime friend Elsa Håkansson. 'Visor' is the common name for folk songs and traditionals in Sweden - simple and intimate songs most often sung in humble, homey situations. Our favorites are a mix of older traditionals and more contemporary folk songs written by poets and folk singers in the 19th century - but all are songs that we grew up with and draw much inspiration from in our musical work, and have now decided to record in our own arrangements. We wanted to make a record that feels like when we sing these songs together in our home, just for our own enjoyment. That’s how these songs are meant to be sung; intimately and with ease, and seasoned by the friendships that are the reason they are sung at all. Veronika, Veronika, var är din blåa hatt? Din vän har gått ifrån dig, men spelar det nån roll? Men tycker du, Veronika, att morgonen är grå? Elsa: The lyrics are tender and loving but also subtly demanding - asking Veronika to wake up and understand something. About love that can be lost, and her own responsibility to hold on to it? Or is it just a plea to her to love him, even though she doesn’t? Bubba: When Elsa and I started playing music together, Cornelis' songs were some of the first ones to enter our kitchen-repertoire. Cornelis is one of the Swedish songwriters I admire the most. He was a master of making a song feel intimate without ever being cheesy. My: We found the Swedish version spelled both with ‘C’ and ‘K’, and decided to distinguish between the original and our translated version by spelling her name differently in each ('K’ is the more common Swedish spelling). Bubba: The song tells the story of a young woman who meets the Neck, a male 'water spirit' who plays enchanting songs on the violin to lure women and children to drown in lakes or streams (Scandinavian folklore). The song describes their pleasureful meeting by the waterside, which ends with someone playing in lonesomeness. It was a common belief that if you brought the Neck a treat of three drops of blood, a black animal, some "brännvin" (Scandinavian vodka) or snus (wet snuff) and dropped it into the water, he would teach you his enchanting music that could make trees dance and waterfalls stop. det har jag hört, ha ha! Bubba: This is a very popular tune from the 1950’s. Evert Taube is one of the most beloved 'Vis-singers' in Sweden. He was an adventurer that traveled a lot (all the way to South America), and sang about his discoveries and countless lovers. The song takes place at a dance in the Swedish Archipelago. Young Eva Liljebäck is the center of the story, she dances with Mr. Rönnerdahl that plays violin and dreams of her as his bride. But he is too dreamy, and Eva ends up leaving the dance with another man. This song holds the kind of magic that, every time I sing it, takes me back to the dock of Elsas summerhouse where we use to spend each summer - I can smell the sea and feel the evening sun on my skin. My friend, my friend and flower of love! and you my dearest one! For you, my friend and flower of love! 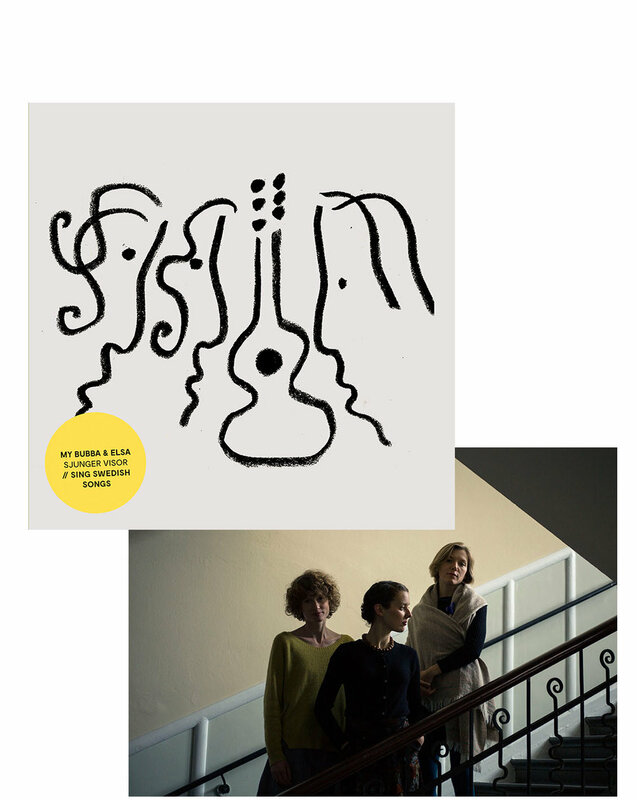 Bubba: 'Kristallen den fina' is a traditional from Skattungbyn, which is close to where we recorded the album. The song expresses longing between a couple. One sings to the other; If I’d go to the end of the world - my heart would still call for you. I can’t remember where I learned this song. But it feels like it’s been with us forever. My: I really enjoyed collaborating on the vocals on this song. It started as a very simple and down to earth folk tune and became something more abstract and dreamy through our harmony arrangement, which I feel goes really well with the longing spirit of the song. Kom ljuva krusmynta, kom hjärtansfröjd! Come joy from the heart*! If you need me for something, we will meet there! Come lilies and aquilegia, come roses and salvia! Come sweet mint, come joy from the heart! Come joy from the heart! Bubba: This is a traditional folk song from Gotland, that is considered to have origins as far back as the 1600's. There are a lot of myths around this song. Some believe that the lyrics are a recipe for an abortion medicine - something that would have been dangerous for a woman to write down, but easy to memorize in the form of song. Vind går i felom - Spelom! Min glyckans glada glejom, när kommer du igen? Elsa: I think of it as a description of a depression in the shape of a landscape, which Hambe calls 'Molom'. He makes up his own words which can only be understood if you listen carefully to the associations of your own mind. Towards the end of the song the depression vanishes and the soul escapes from Molom. Bubba: 'Jag Väntar' is one of the most known poems of the beloved poet Dan Anderson. The poem describes a lonesome man in the woods waiting for the woman of his dreams to cross his path. When she appears he would have all the space in the world for her in his heart and little home. I was driving on a winding road a few days ago when I passed a small house with a sign that said “Wife Wanted” - it made me think of this song. sjung och drick, var glad! My: This song, by 19th century poet and songwriter Carl Michael Bellman, was written for his good friend Movitz and describes his slow death of consumption. Even though Movitz can hardly breathe and his veins are blue and stale, Bellman encourages his friend to keep drinking with him. *We took the liberty to change the original lyrics; from 'man' to 'woman'. Movitz, my heart is bleeding! Cheers Bacchi men and women! My Bubba & Elsa Sjunger Visor // Sing Swedish Songs can be heard on Spotify, iTunes, etc. All translations should be enjoyed with imagination and a grain of salt. A lot of the words have double meanings in Swedish which makes it hard to do the poetry justice. We are deeply grateful to everyone that has helped make this record in direct and indirect ways - it would not have been possible without your spirit and generosity. Thank you to everyone at Lindsberg, Rasmus Blomqvist, Edward Ryan McMackin, Adam Powers, Sean W. Spellman, Greg Giorgio, Joe Lambert, Gustaf Håkansson, Lars Håkansson, Larssons, Nilssons, Åsa Jonmarker, Kollektivet MAST, Shawn Fowler, Brett McNamara, Ken Weinstein, SKIVA, Fake Diamond Records and the geniuses responsible for Svenska Visboken. Where did you leave your shawl? Your lover is looking for it, can you hear his call? But was he the one? But do you find, Veronica, the morning to be grey? And do you ever wish that you had let him stay? to share this song with the world.